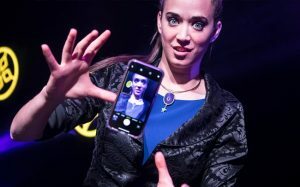 Champions of Magic is a group of five world-class illusionists who have toured around the world, have just come to Boston to the Boch Center, and next will perform in Detroit, Denver, Los Angeles, San Diego, Columbus, and Dallas, with more stops to be announced. Many of the tricks were old standards — the straightjacket escape, the lady who floats in the air, but others were original or had a unique twist. Many left us with some theories about how the tricks could have been performed, but a few left us stunned! Amazing! Most surprising about the night were the stage presences of the performers. With perhaps one exception, they captivated the audience and got roll-on-the-floor laughter. That’s hard to do with a Boston crowd. Our Boston stoicism makes us harder to impress and our Boston intelligence makes us harder to fool. So I feel good about calling humor a great strength of the show. I don’t usually laugh out loud so much even at a comedy show. Most notable were Young & Strange, two performers from the UK, and also the act that was the most original amongst the five total performers. (Apparently, their names really are Richard Young and Sam Strange, so perhaps they were destined for the stage.) At first, they take a trick you’ve seen before, swords jammed through a box but the person inside survives, and do a humorously stripped-down version with just a cardboard box and wooden dowels. There are a lot of dowels and they’re slammed through forcefully. Without spoiling the trick, this is a very impressive and difficult illusion to perform, and they do it effortlessly. 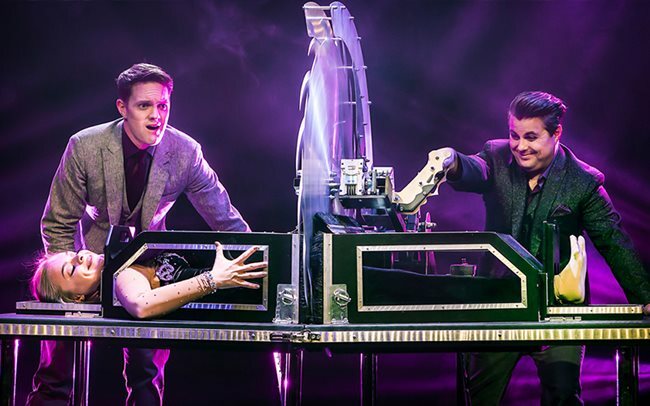 They end instead by playing it up, with a parody of Las Vegas style magicians, where everything has to be larger than life and they disappear and reappear a lovely lady and a tiger. In this case, hilariously, the tiger is a sad looking guy in a tiger suit. Alex McAleer produced the most difficult to figure out magic trick of the evening. He’s a mentalist who pretends to read the minds of audience members, and thankfully doesn’t claim to be real, and speaks up against psychics. (You guys know that you shouldn’t base life decisions on palm readers and astrologists, right?) He also had a strong stage presence and made the audience both laugh and gasp. The most physical stunts of the evening were performed by Fernando Velasco, a Mexican who recently got his American citizenship. He performed a trick made famous by Houdini, claiming to have a contraption once owned by Houdini, in which he got suspended upside down, chained up, into a tank filled with water. In another stunt he escaped from a straightjacket in less than 60 seconds to defeat crushing jaws of death. Kayla Drescher was Boston’s 2013 Magician of the Year and went to college in Boston, and won David Copperfield’s “Search for the Next Great Magician.” She is a close-up magician who may have been thrown by the small turnout on a Sunday evening, or Boston’s normal stoicism — I have heard that Boston is the most difficult major city for comedians. With the awards that she’s won, I am certain that she has better tricks than rubber bands and bottom-dealing cards, and some of the comedy didn’t work. The lemon trick works better when it’s more of a seeming free choice by an audience member. The cast performed together briefly at the start and the end, appearing and reappearing. 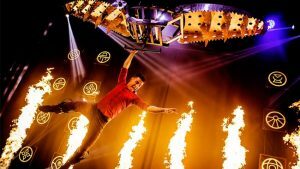 They also floated an audience member in mid-air, sawed someone in half, the staging was good, and they had fire effects and confetti. While the show has some outstanding 5-star performances, 5-star performers and unique 5-star twists, other acts were more common magic standards without the twist. 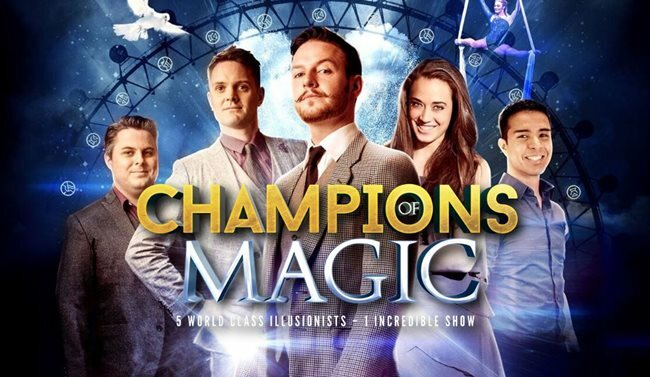 Taken as a whole, Champions of Magic was not perfect but very much worth seeing. 4 stars. The Boch Center is one of Boston’s most important performance venues, drawing musicians, comedians, and other performers from around the world. 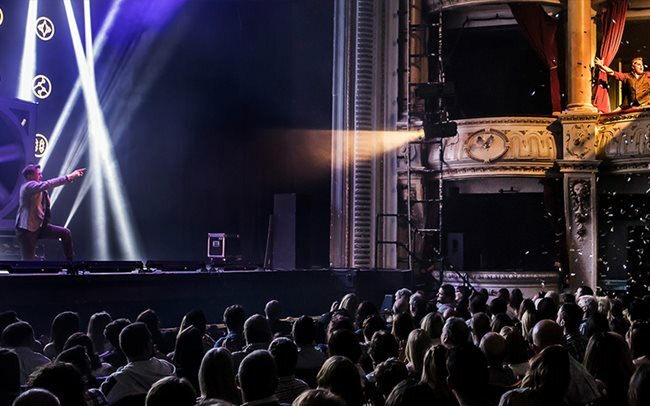 Also coming up at the Boch Center are Christina Aguilera on October 8, Mystery Science Theater 3000 Live on October 10-11, comedian Lewis Black on November 9-10, and the Boston Comedy Blowout on November 17. see www.bochcenter.org.